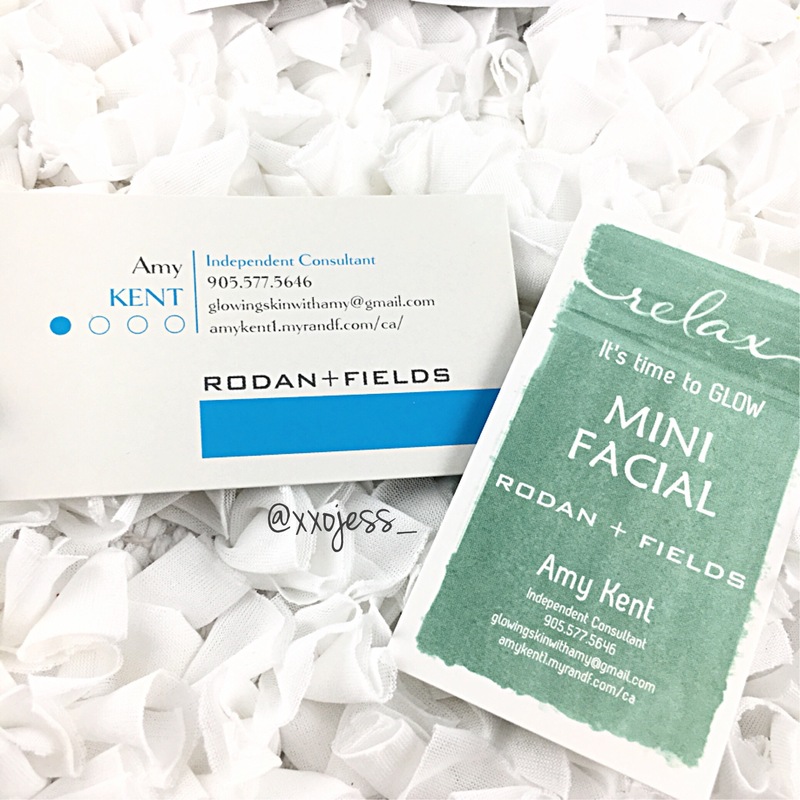 I was really excited to get to try the mini-facial Amy sent me as I’m always up to try new skin care products! I followed the instructions (for the most part) on the back of the card I received from Amy, except I kind of did it all in one go versus breaking it up in the morning and evening since I’m a rule breaker like that 😉 haha. 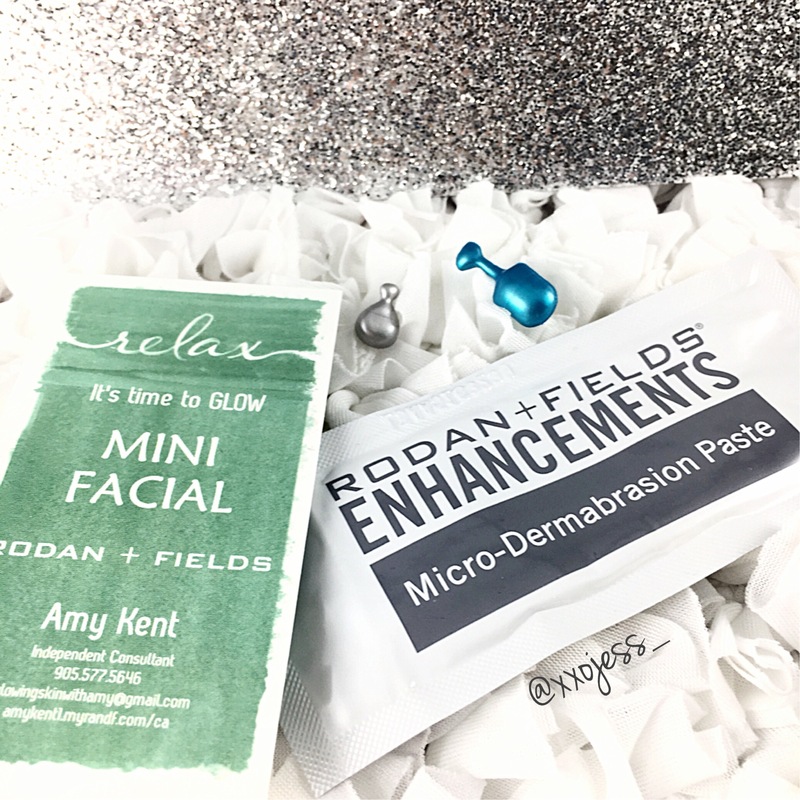 I used the Micro-Dermabrasion Paste first which was a really generous sample – definitely enough for two applications in total. 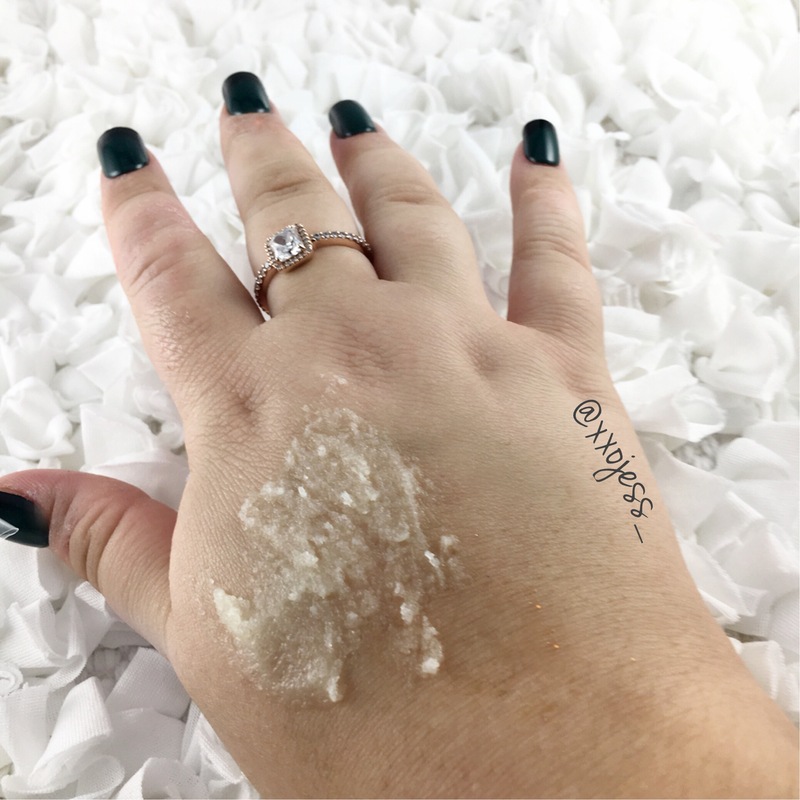 The paste was thick and really grainy, but felt like it was giving me a really good exfoliation! I used it on dry skin and after applying it and rubbing it on my skin, I ended up using water to make it a bit more gentle as it said on the card. Afterwards, my skin did feel a bit dry but it always does after I exfoliate! Here is a picture of what the paste looked like with no water. I guess I should have taken a picture of it on my face (lol) but I had clean hands and thought my hand was a bit more appealing than my bare face haha. After I used the paste, I used the blue capsule as shown in an above picture, which was the Redefine Night Renewing Serum. The serum sample was enough for one use and my initial impression was that my skin felt really smooth but not super hydrated. On the card, it did say that you could use a moisturizer after the serum but I wanted to put the serum truly to the test on its own. I have to say, this was the first time I could somewhat feel firmness to my face- I can’t say it improved it significantly, but I can see myself using this more often and seeing more results! The most amazing thing about this serum was how it improved the texture of my skin. My skin in general doesn’t feel bumpy or anything, but it honestly felt SO smooth and just healthy. As I kept the serum on overnight, I also tried the grey capsule in an above picture, which was the Redefine Lip Renewing Serum. This sample could have been used three times, but it honestly all came out of the capsule so quickly that I didn’t really get to save any of it and use another time. I would have liked better packaging rather than a capsule if there was that much product in there, because I had no idea how to really keep it all in the capsule for further use another day. This serum was really thick and moisturizing. I did notice the texture on my lips felt moist *cringe word* but I can’t really attest to my lips being less wrinkly. I don’t think my lips have that many wrinkles but I would have to use this longer to notice any results I think. Out of all the three items I tried, I would say my least favourite was the Redefine Lip Renewing Serum only because it didn’t wow me. I think it could be a great serum if used over time, but I don’t think that is one of my problem areas to focus on and spend that much money on (personally). 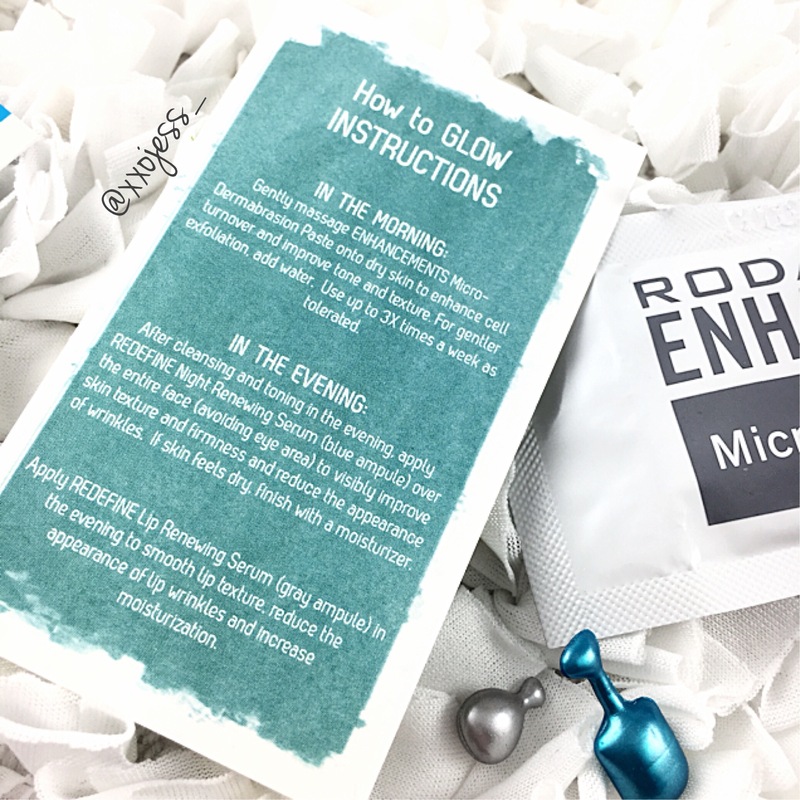 I think all of these could give great results if used regularly- I have to be 100% honest…I don’t know if it was the Micro-Dermabrasion Paste or the Night Renewing Serum or the two in conjunction but the next day my skin felt and looked SO soft. My mom even said my skin looked radiant and “felt like a baby’s bum” and I didn’t even tell her I tried anything different on my skin! The fact that I could feel the difference and someone could see a positive difference in my skin really amazed me. This was only after one use! I have to say that has never happened to me before in terms of skin care. I was really skeptical about noticing any difference and I actually am very intrigued to keep using the paste and the night serum on a consistent basis! I want to thank Amy Kent for sharing this sample with me! I meant to share this review so long ago, but I have been SO busy and Amy has been really accommodating and understanding. She also really knows her stuff and is extremely informative! If you’d like to try any of these products, or any other skin care items from RODAN+FIELDS, feel free to contact Amy with the information in the picture above! Click here to visit the link to her site and here to join her Facebook group (which I’m also in hehe)! SO, what do you think? Do you think you would try this brand out..or have you already?! NOTE: This product was sent for the purpose of an unbiased review. All opinions and thoughts are 100% my own! I’ve tried this before and I really enjoyed it. Great review Jess! Thanks for sharing! Hey this a great and thorough review, I was sent the same products recently. Single use samples! but I felt they were too few products for me to be absolutely sure about how these products work so I didn’t review them as I felt the review wouldn’t be accurate. I am glad I found this review as it at least gives me a good idea of what they do to start forming an opinion. Baby soft skin after one use? That’s saying something! I think I also remember Susie (@blushednbronzed) mention that she uses and really likes this line too!